Here is a list of all the postings Dickw has made in our forums. Click on a thread name to jump to the thread. "Troubleshooting ………….. If you have trouble arming the controller (and the throttle trim has been set to minimum), enter the programming mode and try changing the set-ting to 1.1ms to 1.9ms in Programming Menu 4 to see if it helps correct the problem. If it is a computer radio, you may alternatively increase high and low throttle ATV (endpoint) percentages. Note: Increasing the high ATV will not have a consequence on arming issues, only low ATV." I suggest going into programming mode and try setting up the ESC endpoints again. What amazes me is that a folding prop can hold up under such high rpm! They are mostly handmade specials, but some commercial options are available. Have a look at what I pay for a folding 18" prop that will take up to 8kW (done it) at a mere 8,500 rpm for my F5B planes. The plate pulling out at the front can simply be down to glue as you say , but there is tremendous shock force on that joint when it hits a bump. However i have found that wrapping a little brown paper or even better glass cloth over the front edge of the plate and onto the rest of the wing stops the issue dead. I think that for such a beautiful model, when nerves must have been pretty stretched , you did really well . Next flight you can spend a bit of time investigating the slow speed characteristics mid flight (at height) until you feel confident to slow the spit down more on approach . Thanks for the sugestion for the UC plate repair, I will,definitely try to get some glass cloth in there during the repair. Slowing it down and low speed handling is something I can work on more in the next flights. My checks of the stall charactersistics during the maiden showed it is very gentle with the nose just dipping slowly straight ahead, and I have already had comments on how stable it looked in my low and slow final turn into wind for the touchdown. The 14x8.5 APC two blade prop was fitted to avoid damage to the (expensive) four blade during initial testing and flying, but it certainly flies well on that. Now I know the rate of consumption from that first flight (1520 mAh out of a 3700 for a 7 min flight) it seems I will have plenty of time to practice landing approaches on the next test flight. Most of the flight was on 250 watts or less - not bad for a 6lb plane. On touchdown I ripped the RH undercarriage leg and half its mounting plate out of the wing. You can see it exiting under the LH side of the fuselage in the attached photo. The inquest shows that I might have been a bit too light with the glue in that area, as the landing wasn’t THAT bad, although there might have been a bit of yaw at touchdown. I have already “dry fitted” the UC back in the wing (see photo) and everything still lines up and works OK, so an easy repair. 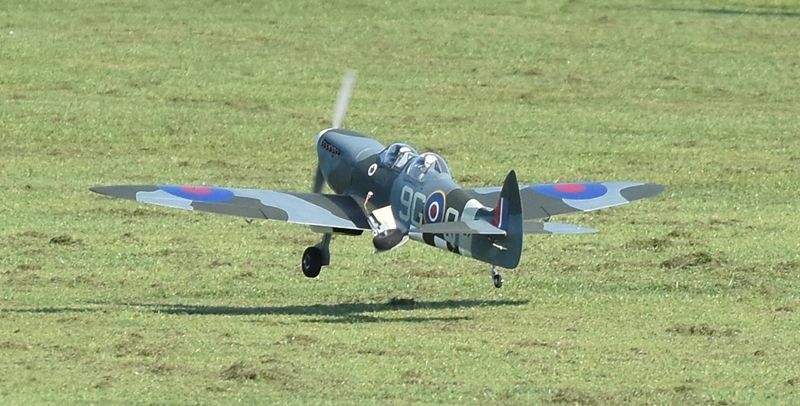 MJ627 had its maiden flight yesterday, and an excellent video put together by clubmate Chris can be found here - thanks Chris. 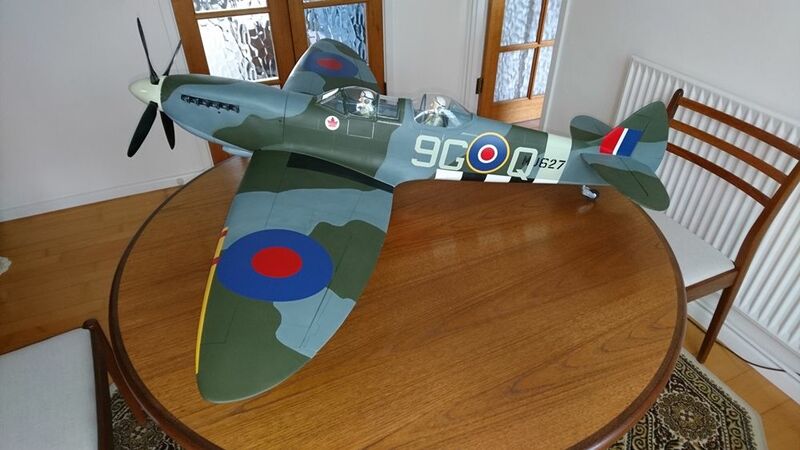 At our club we have a system of inspecting new models before they are flown to ensure safety and noise compliance, and very useful a second set of eyes looking over a model has been, so getting it checked out and range tested was the first task – thanks Martin. Next was the photo opportunity, before I tried to break it, after which I changed from the lovely 4 bladed Biela prop to an APC 14x8.5 and proceeded to check out the ground handling. I fitted a castoring tailwheel as it seemed like a good idea at the time, since then I have heard lots of horror stories about them. It certainly made manoeuvring on the ground easy, but trial take off runs proved hilarious. 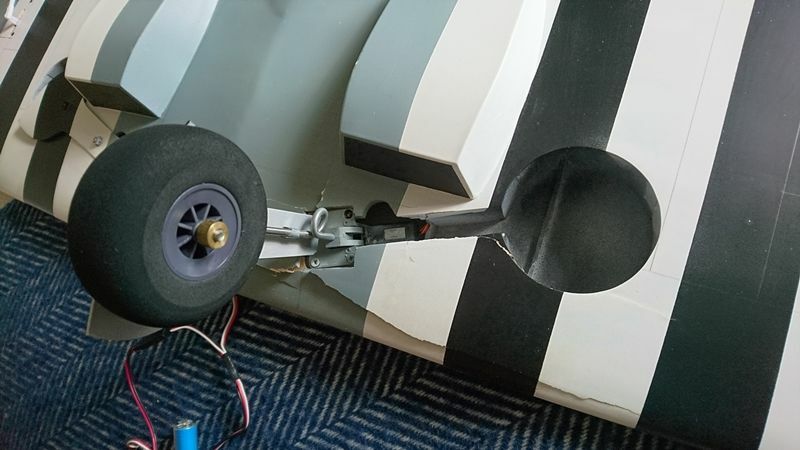 Thankfully I had fitted a gyro assisted receiver and once I had selected Heading Hold and cranked up the rudder gain the take of runs started to look possible even in a crosswind. So, I fitted a fresh battery and tried to calm my nerves. I elected to do a crosswind take off and landing because the into wind runway would have had me trying to land down-hill out of the sun, and I didn’t fancy that. The take off actually went smoothly and it lifted off after a reasonably short run. I don’t like flying with a heading hold gyro as it seems like a fight between me and it, so the first half a minute or so was a bit jerky until I remembered to switch back to normal damping mode gyro. The rest of the flight went OK with trimming out both "UC down" and "UC up" flight modes, checking the stall, and generally getting used to flying a different type of model to the ones I am used to – e.g. 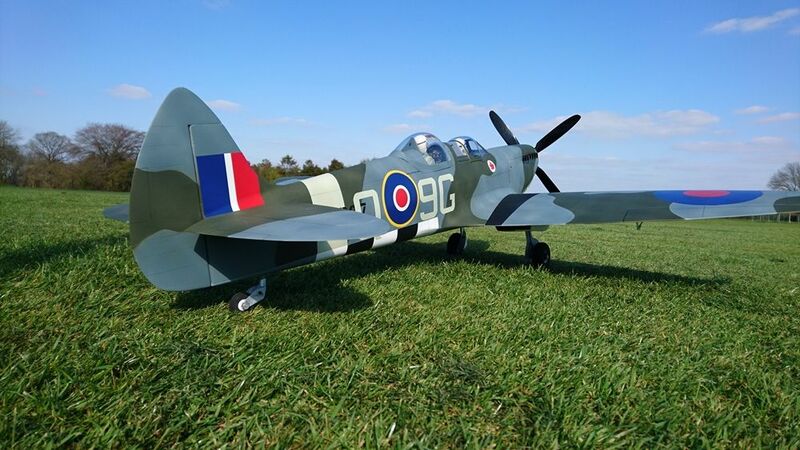 there were some comments from the inevitable audience that the rolls were a bit faster than normal with a Spitfire! A few trial landing approaches from opposite directions (crosswind remember) showed that it didn’t want to come down in our field without a headwind to slow it down. I eventually settled for an approach that would let me turn left into wind if I couldn’t get it down on the first runway. The landing didn’t seem all that hard but the UC will soon be re-fitted (I will cover that bit in a separate post). The flight time was about 7 minutes and telemetry revealed I only used 1520mAh out of the 3700 mAh battery, with a peak power 530 watts. I learned a lot in that one flight and am really happy. Low level photos as requested by Richard. From the late 1980s on I was using Fleet 35MHz gear with up to 1kW brushed motor setups without problems. In the early 1990s I changed to Multiplex because I liked the software flexibilty and tray styling of the 3030 transmitter - still no problems, as expected, with a mixture of Fleet, Multiplex, Schulze, and Simprop receivers. The arrival of brushless motors and changes in battery technology resulted in even higher power levels being used with my 35MHz gear. The only reason I changed to 2.4 was the reduced risk of interference from other users. I think we would all be interested to hear a little more about the mods you made . I for one wouldnt mind a few low angle pictures of the model as if you were about to get in . On short grass or tarmac if poss. Hi all. Thanks for the nice comments - it is largely down to the information and enthusiasm of everyone else who has posted on this and other build blogs that I have managed to complete the project. Richard - I will try and get some photos of that type over the next week and add them, and some details of the mods., to this thread. Possibly - he has a similar vacant look on his face. 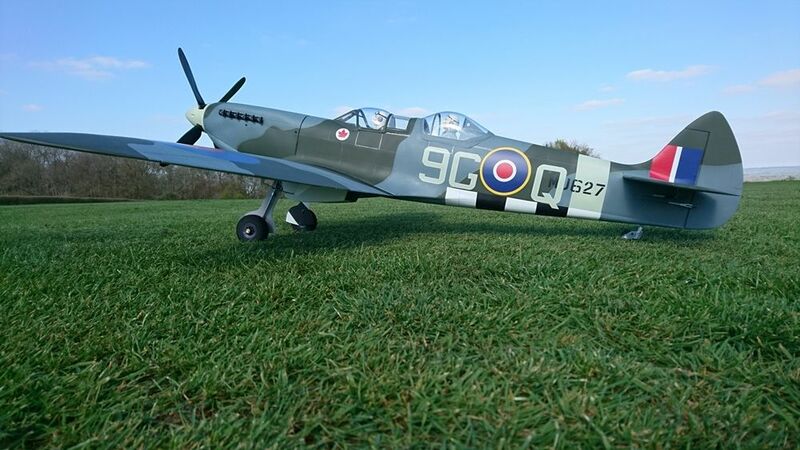 I am please that this thread has resurfaced as I have just got my Spitfire about ready for our clubs pre-season static show. I am not really a scale modeller so this was sort of a new venture for me. Add in the fact that I converted the kit into a two seater means I certainly jumped in the deep end. It is by no means perfect, but I am reasonably please with the result. I might do a bit of weathering to improve the appearance if it survives the maiden flight, but that could be a week or two away while I summon up my courage! It weighs in at 2795gm (6lb 3 oz) ready to fly with a 3700 4s Lipo installed. A bit heavy perhaps, but that has been affected by the modifications to two cockpits and pilots,and my decision to install twin elevator servos (had a couple of servos fail recently). It also has telemetry sensors installed which obviously adds a few grams. I have to say thank you to Richard for an excellent kit that made my job a lot easier than it could have been for a newby to scale. 15.14 Mix-and-Match Tx and Rx Using different makes of transmitter and receiver is common practice .......................... responsibility of making sure that your equipment operates correctly. Above excerpt from the BMFA Members Handbook. Make of it what you will. But if it all goes pear shaped, am I covered by BMFA insurance or not? ..................... Why has the BMFA singled it out? I see nothing in there that suggests you can’t mix brands, just good advice as to what you need to look out for if you do. The BMFA have not “singled it out” – it is part of a long section of advice and guidance on a whole series of issues including batteries, aerials, crystals, and BECs. If you are worried about insurance then ask the BMFA – but note that someone already has and we had the answer quoted earlier in this thread! It's all down to the wording in the BMFA rules/ guidelines. Bmfa need to sort this nonsense out. Which bit of the BMFA rules are you referring to? Did you see the post from Martin Harris at 22:11:28 yesterday? Hyperflight have a good selection of small spinners of a streamlined type, and also prop blades. They seem to be (or have been?) a czech company. I can back up what Engine Doctor says - I use 9gm servos all round in a 1.7Kg (3.75lb) 150 mph+ multi task electric glider. They have performed reliably over several years - including the odd control surface knock. I have been using KST X08 for the past few years but have also been OK with Hyperion and some others. These are the LifeP04 cells I used - expensive initially but have worked out a lot cheaper in the long run. They fit in the bottom of my model box and still leave room for chargers, heated battery storage, and tools. I have tried many Leisure batteries over the years and don’t think they are suitable for our application – none that I bought delivered on capacity or lasted more than 2 years at best. The car batteries I tried actually worked better. 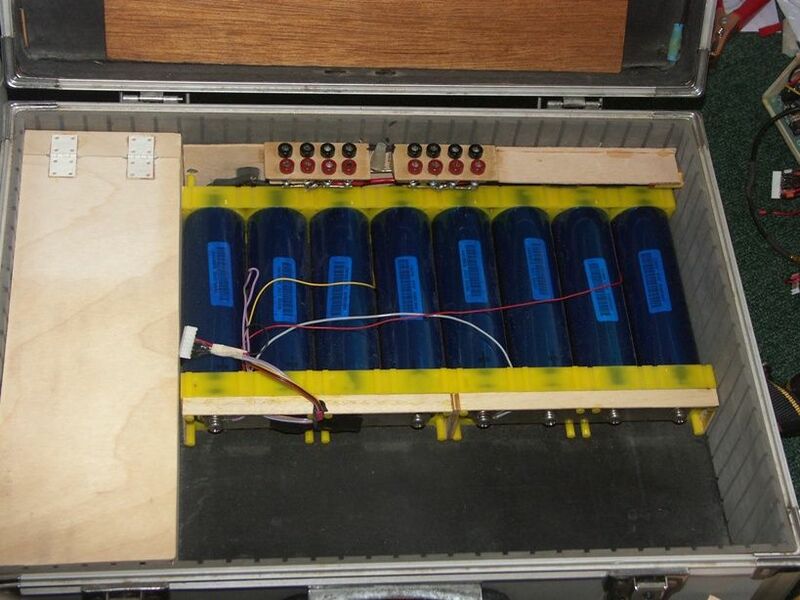 About 6 years ago I invested in a 12v pack made up of 8 x 15Ah Life cells (marketed for electric bikes) in a 4s2p configuration. Although only a nominal 30Ah, the Life cells have a flatter voltage curve under load and handle deeper discharge better so it gives me far more charges than any 75Ah Leisure battery ever did. Also it weighs a lot less, and is still going strong after 6 years. Why do I field charge? Yesterday I had 8 flights, and the batteries I use cost more than £50 each. I took 4 charged batteries with me and recharged each on site. To have eight batteries would mean spending another £200 just for one type of aircraft. Because of weight and space considerations I use a small 2s 300mAh Rx battery – I also recharge those between flights just to be on the safe side. It may be OK, but I don't have any experience of such a device so am reluctant to say any more. Perhaps someone else could comment? c) show me what charge has actually gone into the battery, so I know what I used in the previous flight and that I have a decent charge in for the next flight. There are a lot of reasonably priced chargers like that out there. The charge current is normally related to the battery capacity so most chargers allow you to set the current to suit the battery. That Quanum E4 is a very simple non-adjustable charger – it charges at a fixed 4 amps which is about the max for charging through the balance leads. If your battery requires a 4 amp charge current then it will be as fast as any other charger. If your battery is larger and could be charged at a faster rate, the Quanum cannot do that so will be slower. If your battery is smaller than the 2000 mAh stated in the Quanum spec., then it will be charged too fast – so don't use the Quanum for charging Lipos smaller than 2000 mAh (as it says in the Quanum spec/manual).